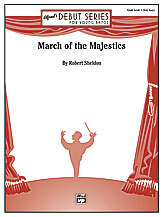 An excellent selection for concert, contest or graduation ceremonies, this is a bold and stately processional march, full of dignity and character. Younger bands will sound wonderful playing the opening fanfare and majestic melody, while focusing on the articulations throughout. A regal flourish brings this piece to a grand ending.